A still image released by IntelCenter in 2009 shows radical Yemeni imam Anwar al-Awlaqi. Suspected head of al Qaeda in the Arabian Peninsula calls Anwar al-Awlaki "our hero"
Al-Awlaki appeared in al Qaeda video released in April; he is wanted dead or alive by U.S.
(CNN) -- A man believed to be the head of al Qaeda in the Arabian Peninsula spoke in support of an American-born Muslim cleric and al Qaeda recruiter in an audio message posted on radical Islamist websites Sunday. "An order was issued by the American government seeking the capture of the noble and righteous hero, sheikh Anwar al-Awlaki, dead or alive," said the speaker, identified as Abu Baseer Nasir al-Wahayshi. "Such a decision promoted so many lies and fabrications, but it showed us the realities and the level of the tragedy involving the alleged rights that they pretend they have in America." 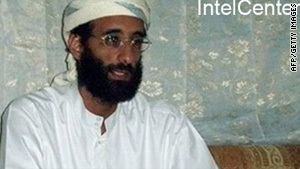 Al-Awlaki appeared last month in a video released by the group. Based in Yemen, he is on the United States' list of al Qaeda leaders targeted for capture or assassination. CNN could not independently authenticate Sunday's audio message, which was posted on various websites known for carrying similar statements, messages and recruitment videos by other al Qaeda figures. In the 10-minute and one-second message, al-Wahayshi tells Americans that U.S. President Obama "is leading you to unfortunate endings, where you will be humiliated." "These decisions will not serve your security interests that you already lost," he says. "Your leader, the one you currently support, already killed many women and children of the Awlaki tribe, so who should be brought to trial? Obama or the innocent ones?" Al-Awlaki is "among his supporters, crowds of Muslims who are angry at your oppressive policies and they will never hand him over. They know very well that it is hypocrisy and a betrayal to hand him over to the infidels," he said. "The sheikh is in good hands and we will protect him in every way." He called al-Awlaki "our hero." In the al Qaeda in the Arabian Peninsula video released to media outlets last month, al-Awlaki said the goal of the U.S. military in Afghanistan and Iraq is to get Muslims to fight each other by blaming market bombings on Islamic militants. According to al-Awlaki, Gen. David Petraeus, the head of U.S. Central Command, came up with the strategy. Al-Awlaki also blamed the U.S. military for an airstrike in December that killed about 30 suspected al Qaeda militants in a district in the Shabwa governorate. The state news agency SABA credited Yemeni forces with the strike at the time of the attack. In January, a top Yemen government official said al-Awlaki met with Umar Farouk AbdulMutallab, who has been charged in a botched attempt to blow up a Northwest Airlines passenger jet en route from Amsterdam, Netherlands, to Detroit, Michigan, on Christmas Day. The attempt to ignite explosives hidden in AbdulMutallab's underwear failed to bring down the plane. Al-Awlaki also has claimed a connection to the U.S. Army psychiatrist accused of fatally shooting 13 people at Fort Hood, Texas, military base last year. Maj. Nidal Malik Hasan communicated with the radical Islamic cleric via e-mail for about a year before he went on a shooting rampage that also wounded 40 people on November 5, the cleric told Aljazeera.net in late December. Hasan, a U.S.-born citizen of Palestinian descent, has been charged with 13 counts of premeditated murder, making him eligible for the death penalty. Meanwhile, an al-Qaeda linked organization in north Africa released an audio recording on Islamist websites Sunday of a French hostage in Niger, suggesting a prisoner swap for his release. The recording released by Al Qaeda in Mahgreb included an appeal from the captive, identified as Michel Germaneau, to French President Nicolas Sarkozy. "We, through this statement, would like to announce to France the legitimate demand of the mujahedeen so they can secure the release of their citizen ... our demands are the release of our prisoners," the recording said. "We will send a list of their names to the French negotiator."